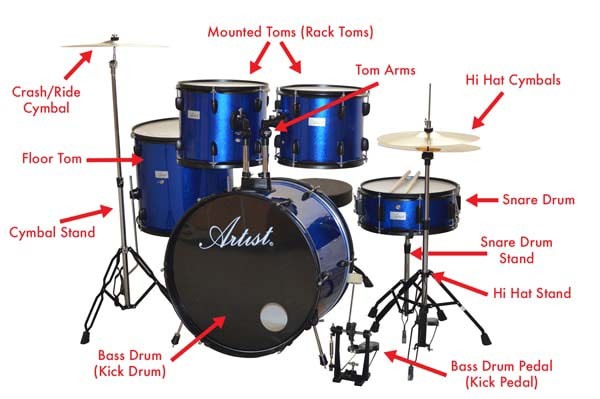 Why Choose an Artist Drum Kit? Choosing the correct size is important for beginner drummers. If you buy a drum kit that's too large for the player, then it can be difficult to reach the pedals and you may develop bad technique and be less inclined to play because it's too uncomfortable. 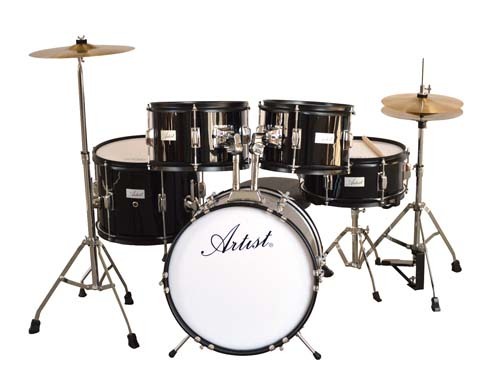 A Full Sized drum kit is suitable for players from 120cm and up. At this height the player will be able to lower the stool to a level where they can reach the kick pedal but still reach the rack toms. 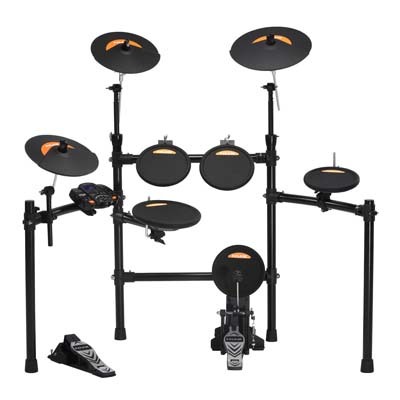 Artist Full Sized drum kits include everything you need to play out of the box, including a pair of drum sticks! Great value at an affordable price. Check it out here. 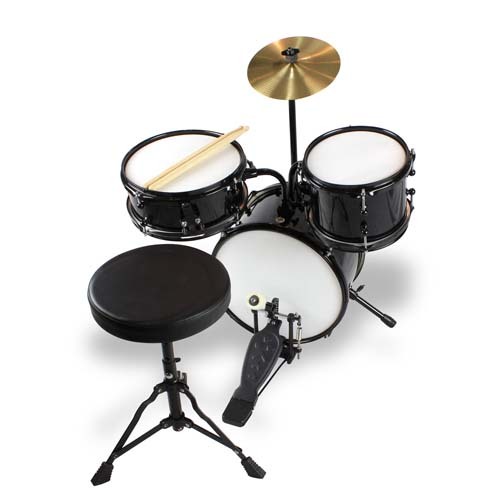 A Junior sized drum kit is suitable for players between 80cm and 120cm. 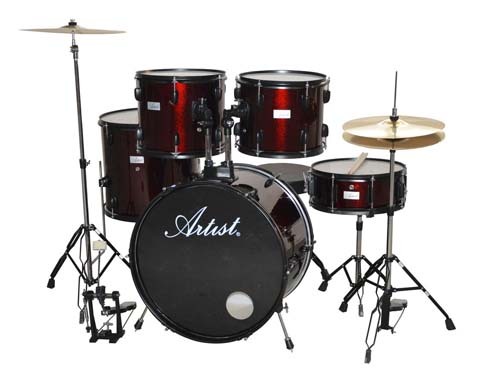 Artist Junior Drum kits include everything that the full sized kits come with, they are just scaled down in size. Instead of a 22 inch bass drum the junior kit has a 16 inch bass drum. The Artist Mini drum kit is the smallest in the range. By no means a toy, this drum kit can be tuned to sound great. It's the perfect way to introduce the smallest players to the world of drums. 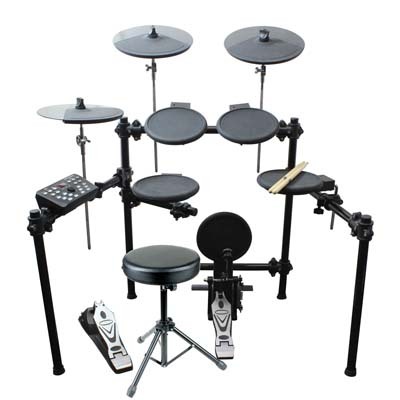 Electronic drums are a great option because of their compact size and compact sound - You can turn them down! This makes them very attractive to parents and people living in close proximity to neighbours. They also sound great on every hit. Electronic drums work by triggering a prerecorded or electronic sample which means you don't need to know how to be abe to tune a drum or to know how to hit correctly. This makes it more enjoyable to play in some respects because it sounds so good. The flip side of this coin is that when you move to acoustic drums it will never sound as good. The reason being that you won't have developed the skill and techniques required to play with dynamics and make a drum sing. Artist EDK260. The perfect, inexpensive introduction to electronic drums. You can control the sound with the on-board volume control. Easy for recording - simple plug into your computer audio software using a MIDI cable or USB cable. Harder to develop a natural feel for playing drums. They feel very different to playing on an acoustic drum kit. Difficult to expand - in many cases you can't add on additional electronic cymbals or drums. NuX DM2. Includes onboard drum lessons for developing your coordination and technique. This is something that all drummer will need, all the time. How hard you hit and the technique you use will determine how quickly you'll burn through your sticks. If you hit hard then there's nothing you can do but keep well stocked. If you're not a hard hitter and are still breaking sticks regularly, you may be hitting the cymbals on the edge or hitting the drum with too much rim shot. 2B Sticks - Heavy - good for hard hitters and marching drums. These applications are a very rough guide. If you're not sure you should buy a few different sizes and see what is most comfortable. The other options you have for drum sticks is tip type and wood type. Maple is the lightest wood but not as strong. Oak and Willow are much stronger and a little heavier. The toughest wood on the market is Hickory, but these are much more expensive due to the scarcity of the wood. The tip can be made from nylon or wood. Nylon tips are slightly more bounce and have more of a sharper "ping" on the cymbals compared with wood tips. These are also a matter of personal preference. Artist 4OHPKR 4 Pack of Double Ply Drum Heads - Rock Sizes. Drum heads should be changed regularly, depending on how often you play. If you play with a coated head (white with a rough surface) a good time to change is when the batter starts to wear off and you're left with a clear patch in the head. Changing to a new head with bring the drum alive and give it a much more crisp, bright sound. Check out our drum head guide here. If you're going to lay down your hard earned cash on a set of drums, it's worth spending a little extra to protect and preserve them, especially if you plan to travel with them. Pulling them in and our of a car can scratch them really quickly and storing them without a csae in a garage can lead to mould, rust or warped shells. Artist Drum Bags. Available in a range of sizes and packs. Check out or Drum Bag Buying Guide here. One of the joys of playing drums is building your kit and collecting parts. It's easy to switch over a crash cymbal or snare drum to suit a different style of music. Once you buy a basic acoustic drum kit you can replace each part one by one with better gear and your kit wil morph into something more specific to your taste. A snare drum provides the back beat to the music and is often the loudest part of the kit. Being the most prominent part you want it to sound good! There are a wide variety of sizes and materials to choose from. Drummers will often have 3-4 or more snare drums in the aresenal. A snare drum sound can change the whole sound of a sound. Cymbals are used to colour the sound of a song and add emphasis on certain parts and changes in the music. The type and sound of a cymbal will change the sound drastically. This is often one of the first changes a drummer will make to their kit. Either adding or replacing a cymbal. A drum kit will often not include cymbals,If they do include cymbals, they will certainly to the job they're intended, but you might find it more enjoyable to play a cymbal closer to your personal taste, whether that be a light jazz cymbal or a heavy, crisp rock cymbals that will cut through a loud band. If you're not sure what cymbal best suits you, then check out our Cymbal Buying Guide. Cymbals, like snare drums are very collectable in the sense that you can use a different cymbal for different applications. Unlike snare drums though you can keep adding cymbals to your kit until you're surrounded by a forest. You can never have too many! A straight stand is a cheaper, often lighter option but doesn't give you as much freedom to place the cymbal in your preferred position. 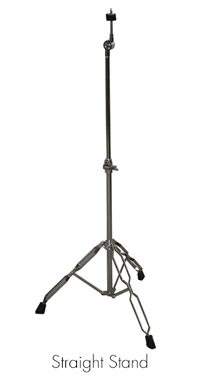 A Boom Stand has a boom arm for reaching over drums or other cymbals. 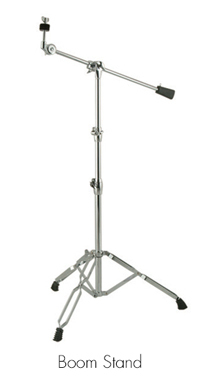 This allows you to position your cymbals in a way that's comfortable for you to play. 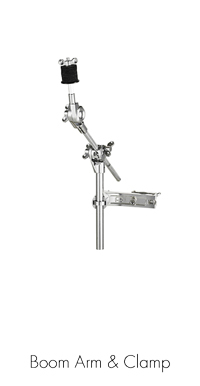 A boom arm and clamp is a great alternative for smaller cymbals. You can clamp this onto one of your existing cymbal stands and save on cost and floor space (there's no base). Perfect for mounting a splash cymbal. 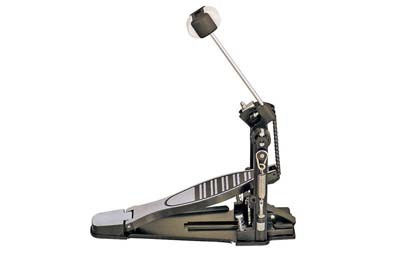 Another popular upgrade is to change your bass drum pedal (or kick pedal). Upgrading to a more solid, stable and responsive kick pedal will really improve your playing once you've been playing for a while. When you're just starting you probably won't notice much of a difference until you build up the muscle in your legs and become more sensitive to the tension and response of the pedal. A pedal with a solid floor plate will give you a much greater transfer of energy from your foot to the beater. The more rigid the pedal, the less energy is lost so you'll find more power and play with greater feel. 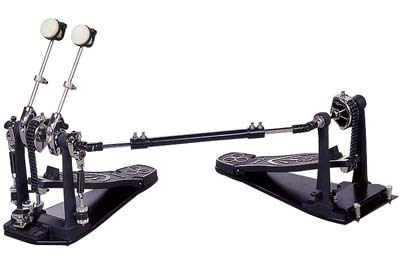 If you're into harder, faster music, or looking to improve your foot technique you might consider upgrading to a double bass drum pedal (double kick pedal). This lets you play with 2 feet on the same drum. The left foot pedal is connected to the bass drum beater by an adjustable shaft. As with most instruments, as a beginner you won't notice the difference between a cheap sounding drum kit and a very expensive one. The weakest link in your sound will be the player, which is why at this point we recommend not spending a lot of money to begin with. Once your playing has improved and your ear has developed you can hear the difference between different sized drums and construction types and choose something more refined to your taste. If you would like more information on choosing the right guitar for you, then feel free to email us, give us a call or click the live chat button below.